This banana fritters recipe is a gluten free breakfast offer that features the fruity flavours of blueberry and banana. A perfect way to start your day. Whisk the Gluten free flour mix with the xanthan gum, salt, cinnamon, and nutmeg to ensure all ingredients are well incorporated. Mash the bananas to a smooth pulp. Whisk the egg with the banana, then add the flour mix. The consistency should be slightly runny (dropping consistency). Heat a little of the oil in a saute pan. Drop the batter into the oil using a desert spoon. When golden, turn over to cook the other side. When golden on both sides, remove from the pan and lay on a paper towel to absorb any excess oil. Continue to do this until all the mix is used. Place the blueberries, sugar and water in a suitable pan and bring to a gentle simmer. Cook for a further 5-6 min. till the blueberries start to break down and the liquid resembles a syrupy consistency. 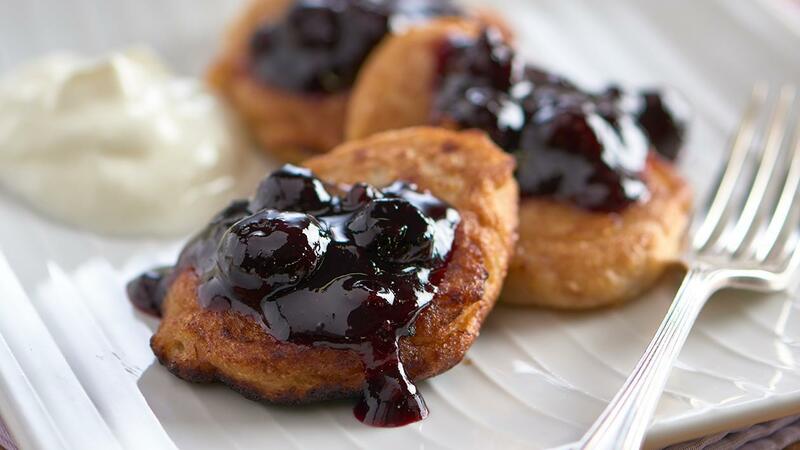 Serve the fritters with the compote and some whipped cream cheese. Mix all the flours together thoroughly or place into a food processor and pulse until mixed.